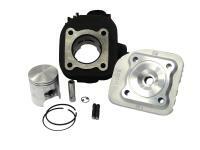 Cast iron Racing Cylinder POLINI 68cc, for HONDA X8R 2-stroke, AC with 2 piston ring(s), pin 12mm, w/o cylinder head, Ø 47,0mm. Iron cast / 47mm bore / 5 ports/ 9.300-10.500 rpms. Phat power performance in lower and upper speed ranges with the POLINI 68cc Sport. Torque and pull that bit down hard - linked with super durability!